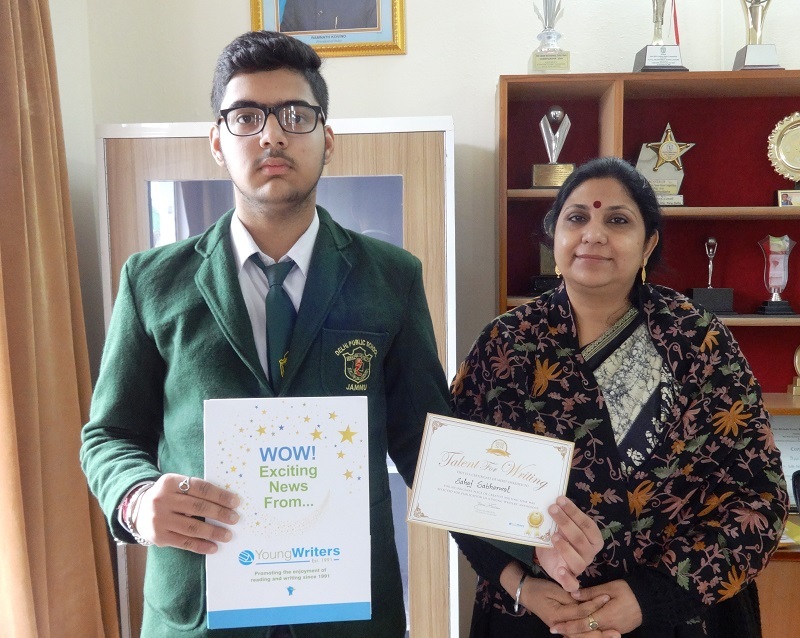 Sahaj Sabharwal (XI-B) of Delhi Public School, Jammu brought laurels to the school and his parents by winning International Acclaim for his creative writing work sent to Young Writers Publishing House in Peterborough, United Kingdom. He has been awarded with a Certificate of Appreciation by the publishing house. His work will soon be published by the said publishing house. He has been contributing immensely for the school magazines regularly. In addition to this, Sahaj has also received an International Certificate of Youngest Poet from Artiy-Prerna Institute of Literature and Science. Earlier, he also received an International Diploma ‘Temirqazyq-the best Poet-Writer of the World-2018’ by World Nations Writers’ Union on 22nd Jan. 2019. Hon’ble President, RCT, Sh. M.K Ajatshatru Singh Ji, Hon’ble PVC, Kunwrani Ritu Singh Ji and Hon’ble Director, Sh. S.S Sodhi Ji extended their best wishes to Sahaj and his parents and wished all the best for his future endeavours.